Last time, generation three entered onto the scene with the birth of little Artemis Astrum. Struck by this moving occasion, both Astra and Christopher were convinced that they needed five grandchildren. Seriously, you two, this clown car mindset is ridiculous! For Astra, it makes sense, but Christopher? Not at all! For my own amusement, I promise it. 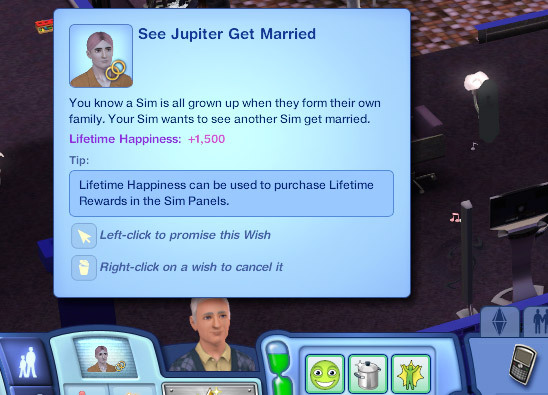 Hey, maybe Jupiter will reproduce once he leaves? Of course, that also allows for moments like this one. What are you two doing? That looks… well, a bit affectionate for two siblings. This isn’t Flowers in the Attic, you two. Oh, right, blame me. This does not look like dancing at all! I’d expect this from Miss. Crazy Pants Diana, but you, Castor? Sigh. 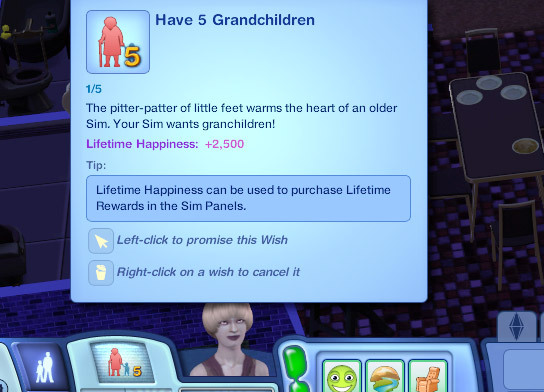 Remember how I was talking about how great it was to have so many sims to care for babies? Yeah, well, I forgot about the traffic issues. 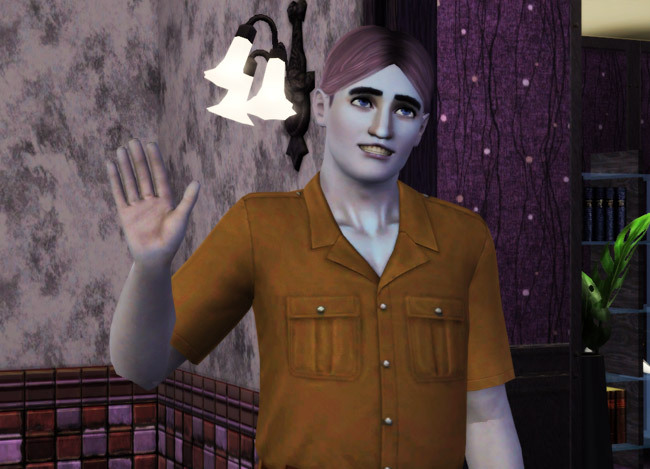 Sims in TS3 don’t have the same annoyance factor as TS2, but still, seriously? There’s a freaking queue building up for Artemis! This is ridiculous. And for those curious, here’s a shot of the house. 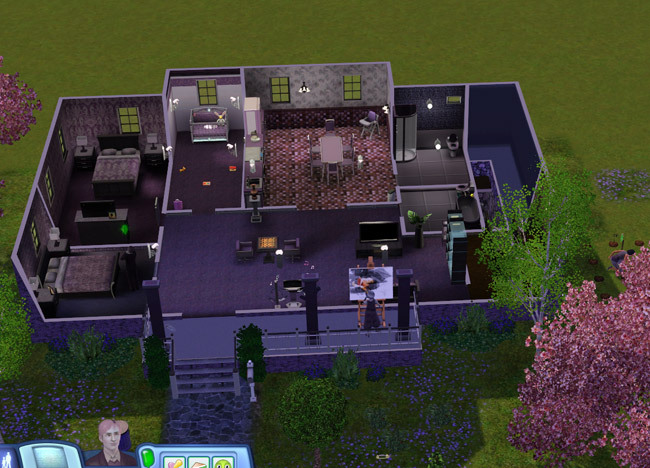 This is actually outdated now, as you’ll see later in the entry that I had to make the living room larger and move some walls around. The layout and everything is still the same, though. I haven’t deleted anything, it all stems from the original foundation/walls placed. The only thing you can’t see is the basement and that’s just a big empty room with two separated bed rooms. I’m not much of a builder, either, so excuse the awful! I did try to do some landscaping, though. Upon Jupiter leaving the family to find his own way in the digital world, both Astra and Christopher spin up this wish! I promise it just because I can and it’s a good way to know if he’s made any progress or not. Somehow, though, I don’t see Jupiter settling down anytime soon… wouldn’t it be nice, though? He could contribute to that five grandchildren want they both have! Miss. Crazy Pants Diana is still climbing her way to level five of the culinary career. During her downtime, she imitates her mother and plays in the sprinklers. She doesn’t bother putting on a swimsuit, though, she does it with style–in her formal wear. I wish this didn’t amuse me nearly as much as it does! She looks like Julie Andrews from Victor Victoria. Artemis becomes a cute little toddler and thankfully, has all the necessary traits to step into her seat as heiress. Unfortunately, she looks a lot like Castor did as a toddler. I was kind of hoping she’d inherit some of Margot’s facial structure–it really is cute, especially for pudding. I know, I know… but it’s true. Wow, you’re all packed in there like sardines. I’ve been contemplating expanding the “TV area” for some time now, but there had never been a true reasoning for it. I guess this is as good a hint as any. You’d swear that they were all couch potatoes or something! If they’re not all congregated in here, then they’re sitting at the kitchen table reading books. I love how Miss. Crazy Pants Diana and Margot are staring at one another here. What’s up with that, you two? Astra’s baby senses start tingling and she finds Margot just in time to prove her suspicions correct. Margot is pregnant with the spare and apparently decided to borrow Astra’s flowered maternity dress. At least it doesn’t clash as badly with skin tone. Of course not, Astra. It’s like a special clown car decoder ring. Just because you’re the heiress doesn’t mean you get a diva license, missy! Of course, maybe the action was prompted by her need for attention from her generally apathetic mother. Castor, as per usual, is tossing her about and poor Artemis looks to her mother for help only to be ignored in favor of the television. Really, Margot, would it kill you to pay attention to her? Aren’t you worried about her safety? Castor is tossing her awful high and we have ceilings in the house now. You better hope so or she’s heading for a land of dysfunction like Crazy Pants! Oh God, Artemis throwing the baby food is pretty much the most hilarious thing I’ve ever seen! I’ve never seen that either but I usually use the “feed on floor” option. Me = impatient. Anyway, I want Artemis to be the heir. Already. She is awesome. In the second to last picture, Margot looks almost exasperated by her husband’s display of grief. RIP Astra! And I never noticed Christopher Steel had brown/green hair. I’m going to have to look closer at him in my game, I think! Artemis is definitely my heiress. She’s an odd one and she seems to have inherited Castor’s penchant for inappropriate facial expressions, LOL! It’s a really weird shade. I only noticed it when I went to change Diana’s hair. It has a weird, green tint to it. Very unnatural looking. Lol, I’d love to see a toddler throwing food. Of course, I’d have to actually get to the stage of having a toddler in my game, first. I’m glad Artemis is the heir, I think she’ll provide much entertainment. I chuckled at her tapping her foot at Grandpa, hehe . Artemis is an odd one, but I’m sure she’ll be fun! I love the portraits of the family. I noticed them in the second picture before you even mentioned them further below. She looks like Julie Andrews from Victor Victoria. Oh man, now I totally want to watch that! OMG I almost woke up my household laughing! he pulls a terrible face. Buddy, really, if I’m going to be taking all of these pictures, you really need to stop that. I am starting to love those off the wall expressions. I am definitely going to miss them when he passes on. Too funny! They are strange because Astra’s is very purple, yet Castor’s is very blue. Odd, but interesting. And no worries, once Castor’s face pulling days are over, Artemis can take over. She seems to have inherited it, LOL! LOL at first I thought the pic of a woman dancing with Castor is Margot. Wait, it doesn’t look like Margot!Yes, it’s a bit creepy for sibling’s dancing. I’ve always have a suspicion about those two (nop, just kidding!) 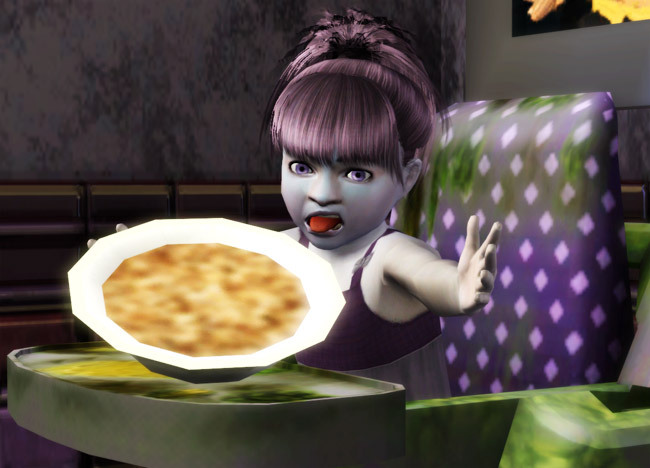 Those queue of everyone wanting to take care of baby/toddler in the house are sure quite stressing for those sims and the player Jupiter is handsome and Diana is gorgeous, too bad she is a bit crazy The pic of Arthemis throwing out the plate is hilarious. I’ve never seen one. The Astrum’s women is definitely clown cars, when Diana the “Crazy Pants” get her turns? LOL! You know, I had that suspicion, too. They’ve always been really close. Hahaha! Diana will not be reproducing anytime soon, but I checked and it seems Jupiter managed to find himself a wife. I think she was pregnant, too!